Solar panels provide electricity from sunlight. They are typically made of silicon crystal slices called cells, glass, a polymer backing, and aluminum framing. Solar panels can vary in type, size, shape, and color. In most cases the size of a PV module refers to the panel’s rated output wattage or electricity generating potential. Solar panels also have voltage ratings. Those with of 12 or 24 Volts are generally preferred for off-grid systems with battery banks. Other solar panels come in less common nominal voltages such as 18, 42, and even 60 Volts. These modules are typically used in grid-tied applications to accommodate the working of grid-tied inverters. Solar panels can be used alone or combined into arrays by wiring them in or in to achieve the needed . The price of most large residential or commercial PV modules can range between .20 and .40 per rated watt. Every solar electric system with batteries should have a solar controller. 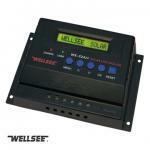 A solar controller regulates the amount of current the PV modules feed into a battery bank. Their main function is to prevent overcharging of the batteries, but solar controller also block battery bank current from leaking back into the photovoltaic array at night or on cloudy days, draining the battery bank. 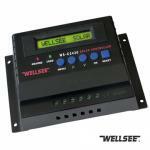 The two main types of solar controller are PWM (Pulse Width Modulated) and MPPT ( Tracking). PWM technology is older and more commonly used on smaller solar arrays. 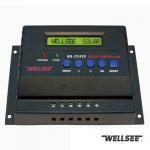 Choose a PWM solar controller that is the same as your solar array and battery bank. The controller must also have enough capacity (in rated Amps) to handle the total current of the solar array safely. MPPT charge controllers can track the maximum power point of a solar array and deliver 10-25% more power than a PWM controller could do for the same array. They do this by converting excess voltage into usable current. Another feature of MPPT charge controllers is their ability to accept higher voltage from the solar array for output to a lower voltage battery bank. Charge controllers typically cost between and 0 depending on size, type and features. An inverter takes (DC) from batteries and turns it into (AC) which is used to run most common electrical loads. There are two main classes of inverters, or grid-capable and , standalone units. Off-grid inverters require batteries for storage. Straight grid-tied inverters don’t use batteries and grid-capable inverters can work either with or without batteries depending on system design. There is a wide range of available inverter features suited to differing system needs and situations. Some inverters have integrated AC chargers so that they can use AC power from the grid to charge the batteries during periods of low sun. Inverters with integrated AC chargers can also be used in conjunction with fossil fuel-based generators for battery charging or running very large loads. Off-grid inverters meant for whole-home usage must have appropriate conduit boxes and accessories that enclose all live wiring. Usually, whole-home inverters are rated to produce 2,000 Watts continuous power or more. Off-grid inverters come in two flavors: those producing current and those producing current. Some appliances (compressors or other inductive loads) and many sensitive electronics (cordless battery chargers, computers, stereos, etc.) will not function properly on modified sine wave power. Off-grid inverters can cost anywhere between 0 to ,000 depending on size and type. A straight grid-tied inverter connects directly to the utility grid without the use of batteries. With these inverters, when the grid goes down the PV system also goes down to protect service linemen from injury due to unexpected live lines during outages. A grid-capable inverter can both connect to the grid and use batteries, which allows for the possibility of back-up power during outages. Grid-connected inverters also generally produce 2,000 Watts or more and cost about ,000 to ,000. Photovoltaic system is a method to generate solar energy into electricity. The solar photovoltaic system uses solar panels made of silicon to convert sunlight into electricity. The system consists of multiple components. PV modules (groups of PV cells) commonly known as PV panels; batteries; a solar controller; an inverter for a utility-grid-connected system; mounting hardware. The Photovoltaic array or the solar panel is the basic functional block of a PV system. There are mainly three basic configurations that are widely used for the solar PV systems. In the simplest configuration the PV array supplies power to the electrical load directly. This system functions only when sunlight is available as no storage is involved in the system. In the most common configuration the PV array that powers charges a storage battery and thus it remains functional even at night and during periods. The PV-hybrid system generally depends on an auxiliary source of power. This configuration is particularly suitable for applications in regions with large variations in sunlight conditions. The solar controller acts as a voltage regulator preventing overcharging of the storage batteries. A photovoltaic control can automatically sense when the batteries are fully charged or are close to being depleted and reduce additional energy to the batteries or prevent further current discharge accordingly. The inverter converts the electricity into a form suitable for household lights and appliances. Storage batteries are sometimes required as photovoltaic cells produce electricity only when they are illuminated. Thus, in order to store energy for overnight use or on overcast days storage batteries are required. A solar photovoltaic system can produce 4 to 50 kilowatts of electricity. Generally, a 10-kilowatt system generates approximately 16,500 kilowatt of electricity in a year. 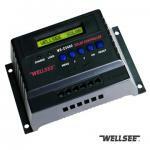 Join WELLSEE to improve your solar life!